Gutter cleaning is a task that should be handled by professionals. Eavestroughs are an integral part of your home’s drainage system, and even the smallest blockage or clog can spell disaster for the rest of your home. The most common culprit for eavestrough blockages is debris, which needs to be cleaned out safely and effectively every year. We have over ten years of professional eavestrough cleaning services and can clean out your entire drainage system, from the gutters right down to the downspouts and fascias. In North York, a combination of humidity and cold temperatures can cause water to severely damage your home. This is especially true with eavestroughs, which can impact your entire home from the roof right down to the foundation. 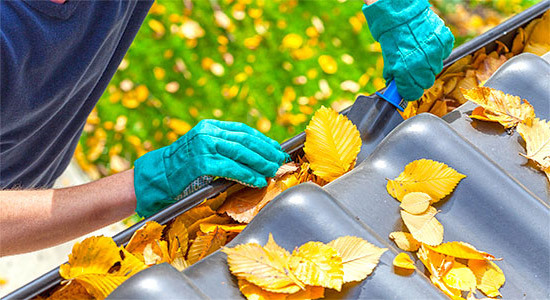 Debris, leaves, and other materials are the most common causes of problems for eavestroughs, which is why your North York home needs professional eavestrough cleaning services. When your gutters are dirty, it affects the drainage system of your entire home. Clogged gutters tend to leak water into spaces where water shouldn’t go and this can lead to expensive water damage, including flooding and even foundational repair. We recommend you get your eavestroughs cleaned by professionals every spring and fall, or at least annually. We even make regular eavestrough cleanings easy, with a schedule system that will ensure our cleaners come every year so you don’t have to worry about constantly booking appointments. In addition to eavestrough cleaning services, we provide two additional services that keep your gutters working at their absolute best. The first is downspout guard installations, which help funnel water into your downspouts, reducing splashing and helping your roof shed water more effectively. The other additional service we provide is eavestroughs flushes. This service is essentially a gutter inspection, letting us pinpoint any problems in your system. Then, we can repair the problem spots and stop eavestrough issues before they become bigger problems. Your North York home deserves professional and experienced eavestrough cleaning services. Our expert gutter cleaners are trained to quickly and effectively clean out your gutter. They can also inspect your system for any potential issues and repair them before they become bigger problems. Gutter cleaning is also dangerous work, often involving ladders and working on uneven surfaces. Without the right equipment and training, what seems like a simple job can often lead to serious accidents. By using professionals, you can ensure that the job is done safely and properly. Using professional eavestrough cleaners can save you money and keep you from doing dangerous work. Water in eavestroughs tends to seep into the surrounding spaces, especially roof tiles and any wood on the side of your home. This moisture can lead to rot and other problems, ruining your home and potentially causing even more costly issues. Eavestroughs need to be regularly cleaned to prevent this water from standing still, which is why professional cleanings need to happen on a regular basis. The other big issue is freezing water. Since North York experiences a humid climate with frequent freezing periods, water tends to accumulate in places and then expand once the temperature drops. Expanding water can do anything from crack your driveway, damage your foundation, or even cause your eavestroughs to bend and break right off the side of your home. NICK’S Window Cleaning serves the entire North York area, working on commerical & residential properties up to a max. working height of 3 storeys. Our team is professional, trained, and fully insured. With a minimum of impact to your schedule or day-to-day life, your property will look great, and feature eavestroughing and gutters that drain properly, once we are completed. Customer satisfaction is our most important concern and we strive to deliver exceptional services and build long-lasting partnerships with our customers. Contact NICK’S Window Cleaning for your North York gutter and eavestrough cleaning needs and discover why people are switching to us. Mold is dangerous. It can cause major health problems for you and your family. And mold spreads very quickly once it gets into your house. Mold can grow and spread from your eavestroughs. When there is water in your eavestroughs and mold spores are deposited in them by the wind or on debris like dirt or leaves your house can develop mold. And once that mold gets into your house it can be almost impossible to get rid of. Getting your eavestroughs cleaned by a professional can stop the growth of mold and protect your family and your home from a mold infestation. If you don’t want to spend days trying to clean out your eavestroughs hire a professional to clean them. It’s hard and dirty work to clean out leaves, dirt and water from the eavestroughs. There may be other things in there that you don’t expect like rodents and insects as well. If it’s been awhile since you cleaned out the eavestroughs you’re much better off hiring a professional who can get them cleaned out fast and deal with anything that has taken up residence in there. One of the biggest reasons to clean your eavestroughs regularly is to prevent damage to the foundation of your home. When eavestroughs are clogged the water backs up and it can drip and leak into the foundation of your home. That water can cause mold, cracks in the foundation, and other problems. When a professional cleans out your eavestroughs it cuts the risk of foundation damage. A professional cleaner can also look for any signs of foundation damage and alert you so that you can get problems fixed before they become serious problems.